Join From Outside the U.S. The Economic Development Division is pleased to announce the winners of the 2017 Donald E. Hunter Excellence in Economic Development Planning Award. The Hunter Award ceremony will occur during the Economic Development Division’s Annual Meeting and Reception in New York on Monday, May 8, 2017. Sharing a 300-mile border with Mexico, Arizona’s economy is closely linked to and benefits from a strong relationship with Mexico. As gateways, Arizona border communities enable the flow of billions of dollars of trade and millions of cross-border traffic each year. In 2013, the Border Communities Roadmap was the result of a collaborative effort of four state agencies (Arizona Department of Transportation, AZ Commerce Authority, Office of Tourism, and AZ-Mexico Commission) in partnership with border communities. The Roadmap examined best practices along the U.S./Mexico border and presented a strategic action plan with economic development priorities/policy direction. The Roadmap identified 5 Game Changers and 5-Pronged Response; one was to “Build a Border Business Case” focused on an economically strong binational region. Four state agencies provided funding augmented with public and private funding from border entities, and Partners for Strategic Action, Inc. (PSA) was hired (firm completed the Border Communities Roadmap) to implement the process and develop the Business Case. Ink wasn’t dry on the Roadmap when the cities within Yuma County and San Luis Rio Colorado, Sonora, moved forward to develop the binational Border Business Case. 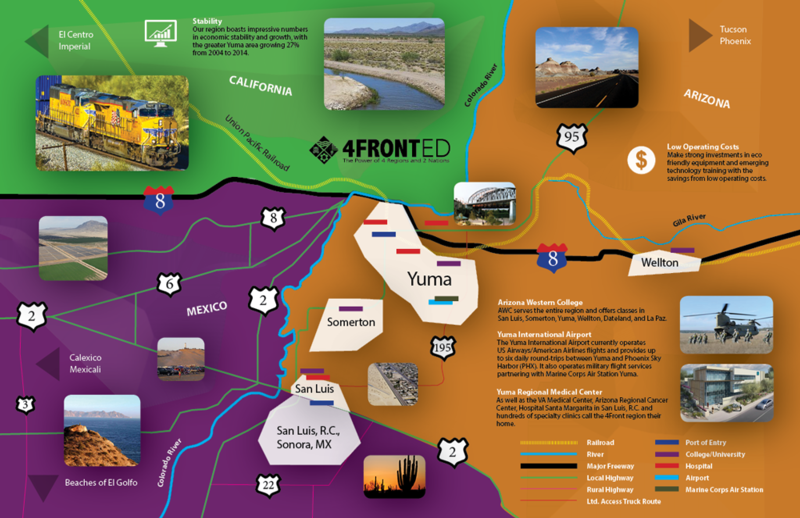 The 4FRONTED initiative was a binational effort focused on consensus-building resulting in the Border Business Case and the creation of a regionally-funded binational organization that is successfully working on implementation. The region’s recruitment success has increased. Flextronics purchased a San Luis Rio Colorado building that provided opportunity to develop new product lines. City of San Luis, Arizona, and Secretariat of Economic Development, Baja California, signed an agreement to collaboratively strengthen business development/entrepreneurism. A comprehensive supplier business recruitment strategy was developed. Another manufacturing company located in San Luis Rio Colorado (medical equipment) creating 150 jobs and another 300 projected jobs. Though new companies have expanded in Mexico, the binational economy impact is great in terms of new jobs, financial investment, and new U.S. supplier growth. The main contact for 4Fronted is Peggy Fiandaca, AICP, president of Partners for Strategic Action (PSA). She may be reached at 480-816-1811 or via email at peggy@psaplanning.com. In 2015, San Francisco commercial real estate rates had reached all-time highs, surpassing Manhattan as the priciest in the United States. Neighboring communities Oakland and Silicon Valley weren’t far behind due to a surge in demand from the tech sector coupled with limited space. Companies needed options, as both small and emerging companies were most feeling the squeeze. Concord, California, a job- and housing-centric East Bay suburb, recognized it could compete with affordability, transportation accessibility and a no-drama business-friendly economic development office. Plus, Concord’s revitalized historic downtown was attractive to businesses and residents alike, which enables the city to provide a better fit for Bay Area businesses and their millennial workforce. The city saw that taking that message to market would attract new economic development opportunities. 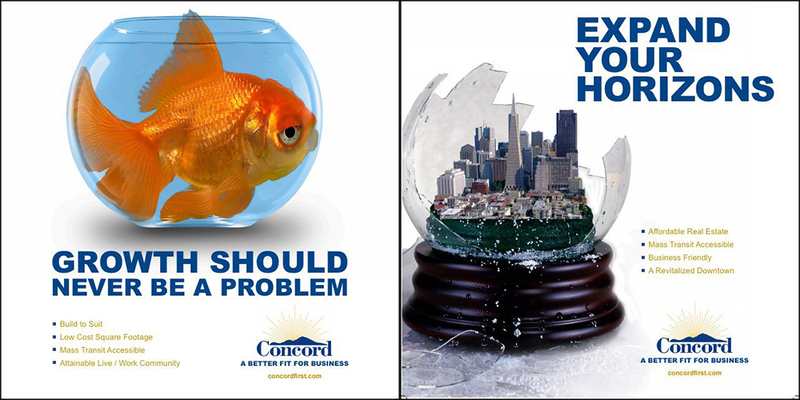 Concord’s Economic Development Office teamed with local advertising and public relations agency AMF Media Group to coordinate a strategic promotional plan that included public relations, a targeted advertising campaign and a revitalized economic development website: ConcordFirst.com. To demonstrate that the city truly is “A Better Fit for Business,” the team secured earned media coverage in business- and real estate-focused media outlets featuring Concord entrepreneurs in a variety of industries — from craft beer to manufacturing technology startups. The same entrepreneurs served as ambassadors who spoke to the messages portrayed in the advertising campaign and in testimonial videos displayed on the website. Public relations efforts kicked off in September 2015, followed by the launch of an innovative advertising campaign in March 2016. The main contact for “Concord: A Better Fit for Business” is Brian Nunnally, business development manager, City of Concord, California. He may be reached at 925-671-3018 or via email Brian.Nunnally@cityofconcord.org . The Excellence in Economic Development Award is named for Donald E. Hunter, who passed away in late 2009. He was a long time and very active member of the American Planning Association, always urging greater attention for economic development planning. He was President of Hunter Interests Inc., and served as a board member of the International Economic Development Council (IEDC) and the International Downtown Association (IDA).